Picture of the GRS 1758-258 microquasar, obtained with the Jansky Very Large Array radiotelescope at 5 GHz frequency radio waves. The white line shows the Z-shape path formed by the relativistic plasma produced in the core region, where the black hole is located. Researchers from the Institute of Cosmos Sciences of the University of Barcelona (ICCUB) and the University of Jaén have described, for the first time, the structure of a Z-shaped galactic microquasar. This astronomical object is considered to be a small-scale version of a winged radio galaxy, so far considered one of the distant sources which are potential emitters of gravitational waves. In this sense, the main conclusion of the study, published in Nature Communications, says that not all winged radio galaxies would be the source of gravitational waves, unlike what was thought so far. The microquasar is an astronomical object fed by a stellar black hole, which is smaller than the ones at the centre of radio galaxies, and produces a radio jet towards opposite directions. In the study, researchers “could determine that the Z-shaped morphology of the studied microquasar, the GRS 1758-258, can be explained with hydrodynamic interactions with the surrounding medium” says Josep M. Paredes, from ICCUB. This result can be extrapolated, suggesting that this scenario could work in winged radio galaxies, since these objects follow the same physical laws. So far, it was thought that those radio galaxies were X or Z shaped due the merger of two black holes, a process in which gravitational waves are generated. When these waves are produced at such a long distance from us, it is not possible to distinguish them individually and a gravitational wave background noise is created. “Our results allow us reaching the conclusion that not all winged radio galaxies would be the origin of gravitational waves, which was commonly believed so far –says Valentí Bosch Ramon, researcher from the ICCUB-, since some of them owe their structure to hydrodynamic processes that would not create these kind of waves. Considering these results, the background of gravitational waves would be weaker than what it was thought so far” concludes the researcher. 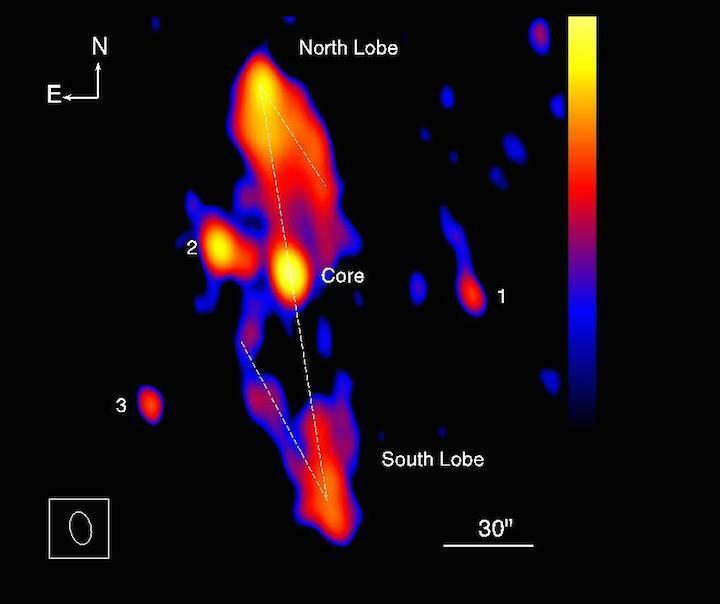 In order to determine the Z-shape of the GRS 1758-258 microquasar, several observations have been made with the Jansky Vergy Large Array in New Mexico (United States). The results have been added to all the observations of the same microquasar that were carried out in previous decades. Gathering all these data made possible to reach the required sensitivity to describe the Z-shape of GRS 1758-258 and deduce the processes that form it. This study was conducted by a team of astrophysicists formed by the researchers of the University of Jaen Josep Martí and Pedro Luis Luque Escamilla, in collaboration with Josep M. Paredes and Valentí Bosch Ramon, from ICCUB.